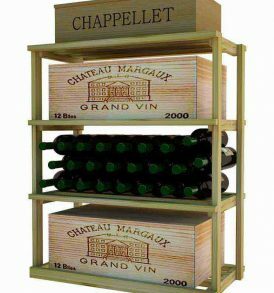 Our versatile Rectangular Bin and Case wooden wine rack can store 7 wood cases with an additional one on top, or store uncrated bottles in the compartments. 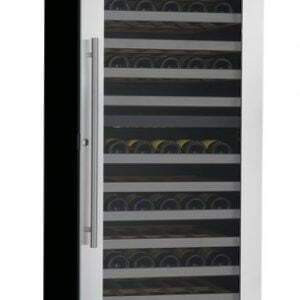 Perfect for easy wine storage when you receive shipments from your wine club. Product requires assembly. 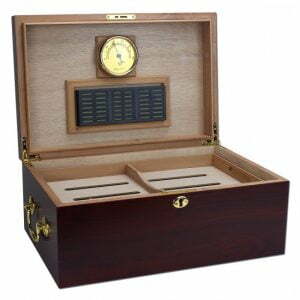 Please note: molding packages are available separately. 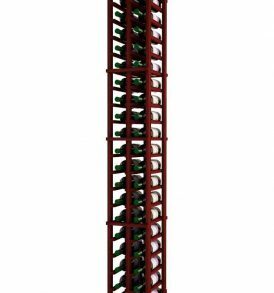 Bottom Rail: All the racks in this Series have a 1 7/16″ square cut bottom rail. 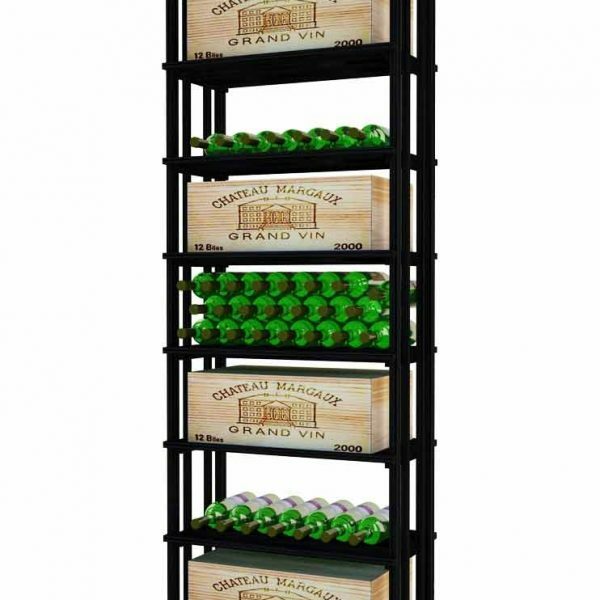 With these rails, your bottles are stored securely above the floor level so they do not break accidentally by hitting a hard floor. 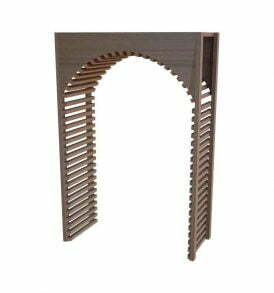 Added to this,, the base molding supplied with this Series is 1 7/16″ high and can be applied directly to the front of this rail. 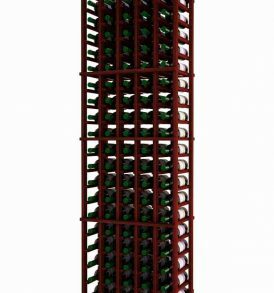 Designer Series – 5 Column Individual DESCRIPTION: The five column Individual bottle rack is a great choice to start your wine storage. 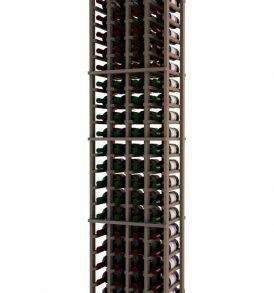 It’s one of our most popular style of wooden wine rack. 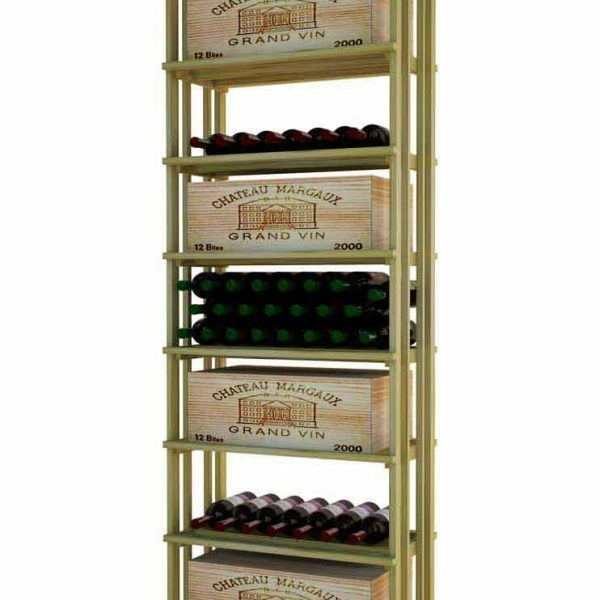 In our Designer Series, each bottle is cradled on two rails that are cut with beveled ends and rounded edges which ensure the labels will not tear when the bottles are removed. 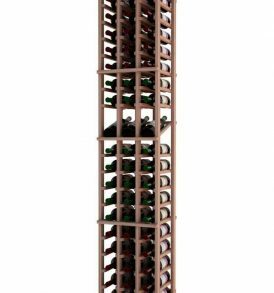 The Individual Bottle wood wine rack is 5 columns wide x 19 rows high. Product requires assembly. Please note: molding packages are available separately. 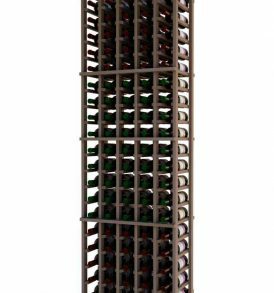 Full wine bottle depth coverage at 13 1/2″ deep Beveled ends and rounded edges Labels are safe from tearing Mix and match components Made in the USA Specs height – 72″ width – 23-3/16″ depth – 13-1/2″ bottle capacity – 100 Spacer Bars: Spacer bars are sent with a dado that snugly fits each column of your racking. You can assemble the rack with the nails provided, or you can utilize a brad nailer for faster assembly. If you would prefer to assemble your rack with screws you will need to predrill and countersink the holes to ensure you do not split the material. Bottom Rail: All the racks in this Series have a 1 7/16″ square cut bottom rail. 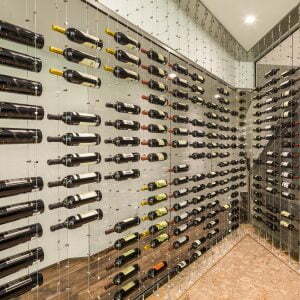 This allows the bottles to be securely held above the floor level so the bottle does not break accidentally by hitting a hard floor. 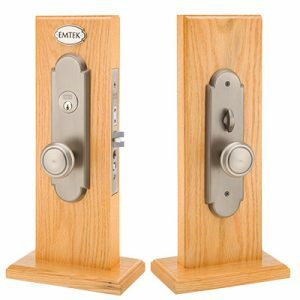 In addition, the base molding supplied with this Series is 1 7/16″ high and can be applied directly to the front of this rail. Designer Series – 4 Column Individual The 4 Column Individual Bottle wine rack supports the same individual bottle racking design as our other products but only has four columns. Depending on your space, you can mix and match with others in the series. 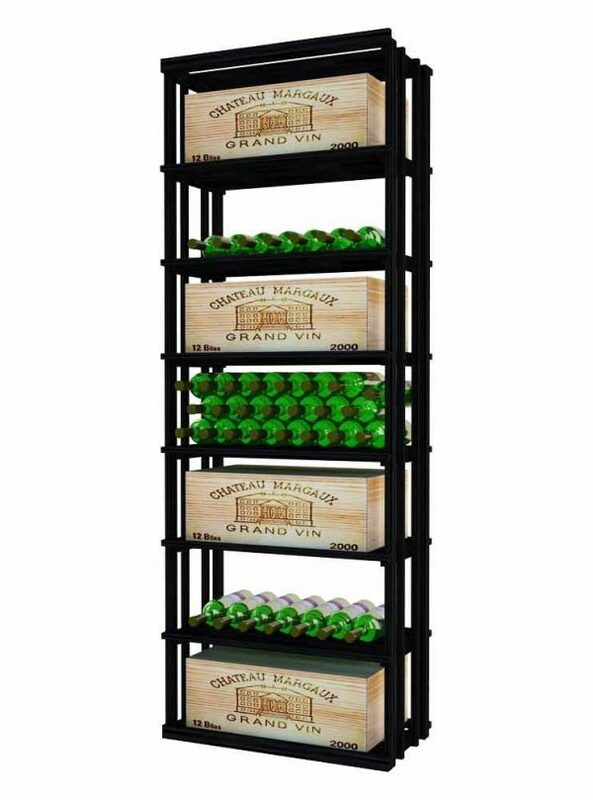 Each bottle is cradled on two rails that are cut with beveled ends and rounded edges which ensure the labels will not tear when the bottles are removed. 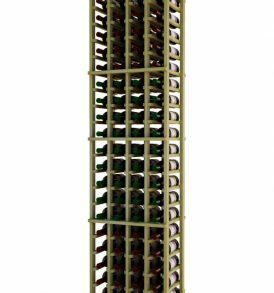 The 4 Column Individual Bottle wine rack is 4 columns wide x 20 rows high. Product requires assembly. 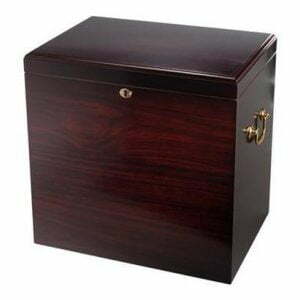 Please note: molding packages are available separately. 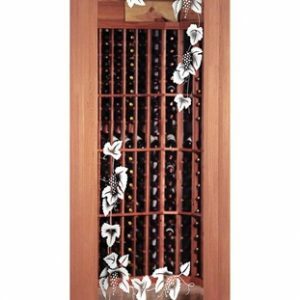 Full wine bottle depth coverage at 13 1/2″ deep Beveled ends and rounded edges Labels are safe from tearing Mix and match components Made in the USA Assembly Instructions Specs height – 72″ width – 18-11/16″ depth – 13-1/2″ bottle capacity – 80 Spacer Bars: Spacer bars are sent with a dado that snugly fits each column of your racking. You can assemble the rack with the nails provided, or you can utilize a brad nailer for faster assembly. If you would prefer to assemble your rack with screws you will need to predrill and countersink the holes to ensure you do not split the material. Bottom Rail: All the racks in this Series have a 1 7/16″ square cut bottom rail. 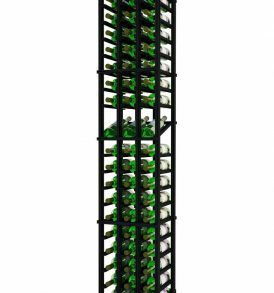 This allows the bottles to be securely held above the floor level so the bottle does not break accidentally by hitting a hard floor. In addition, the base molding supplied with this Series is 1 7/16″ high and can be applied directly to the front of this rail.